Once setup, using it is no different from normal debugging. The downside is that some newer GAE functionality won't work. Now let's go back to our workaround. 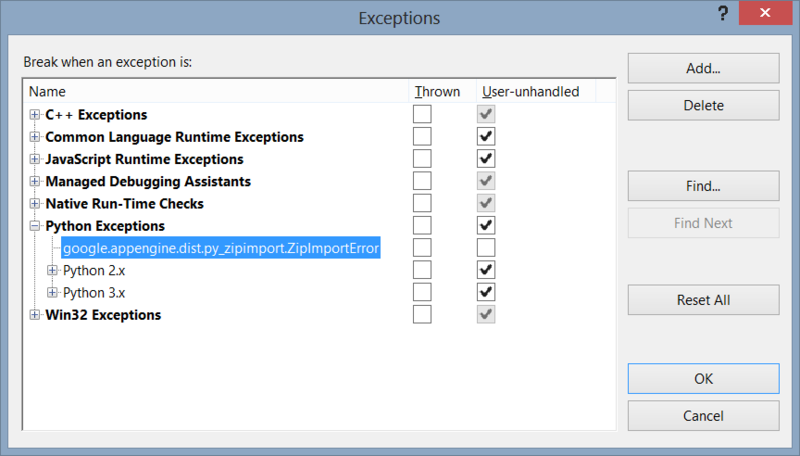 set Working Directory to: ..
in Visual Studio, set breakpoint(s) in your python code and press Start. DO NOT use the Google App Engine launcher. A python.exe command window opens with a warning regarding the use of a deprecated version of dev_appserver.py, the port the app is running on, and how to open the admin console. In our example we've configured port 8800 in the project's debug properties. As a result, the web application runs at http://localhost:8800 and the admin console is available at http://localhost:8800/_ah/admin. Open a browser and navigate to http://localhost:<debug port number>. When breakpoints are hit, focus returns to the IDE.